FLIPPIN, Ark. (August 4, 2014) – Anglers Marine, a mainstay in the Southern California bass-fishing world, recently received the prestigious Legacy Award from Ranger Boats. 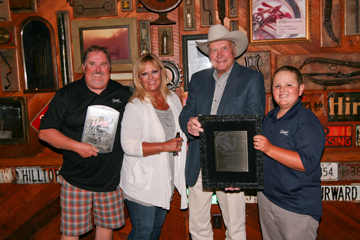 Presented by Ranger Boats founder Forrest L. Wood, Ranger President Randy Hopper and Ranger Vice President of Sales Keith Daffron during their recent National Dealer Conference, the award is one of the highest honors that the acclaimed boat brand bestows on its dealers. The winner of the Legacy Award is voted on by members of Ranger’s sales staff, warranty department, delivery staff and others. The award recognizes dealers whose attitude, service and support benefit their customers and uphold the standards of those whose past work helped to make Ranger the successful company it is today. Family-owned and operated since opening in 1991, Anglers Marine has been a one-stop-shop for anglers in Southern California. Anglers Marine sells both new and used Ranger boats, is staffed by factory-authorized service professionals and offers a full-line tackle, accessory, electronics and pro shop in its Anaheim location. Anglers Marine offers two dealerships to better serve the needs of anglers and boat buyers in Southern California and surrounding areas. The Anglers Marine dealership in Anaheim is located at 3475 E. La Palma Ave.; customers in the San Diego area can visit the Anglers Marine store in Lakeside, Calif., located at 11919 Woodside Ave. #D. For more information on the newest Ranger boats, to schedule an appointment with a salesperson or a service advisor, call (714) 666-2628 (Anaheim) or (619) 449-3474 (Lakeside) or go online to https://www.anglersmarine.com.